For caribou, the numbers tell the tale. The famous George River herd of Quebec and Labrador, which once numbered close to one million individuals in the early 1990s, now has just 5,500. Many other herds across Canada have declined by more than 90 per cent in less than 30 years, and as many as 15 herds in the mountains of southern British Columbia and Alberta today have fewer than 25 individuals. What these numbers tell us is that we have watched, measured and talked while caribou declined instead of taking action to save a species that has already lost half its range in North America. As someone who has spent countless hours quantifying this attrition of caribou populations and their habitat, I find it disheartening that governments — federal, provincial and territorial — continue to drag their feet while the problem only gets worse. Caribou are a symbol of Canada's North, highly adapted to living for months in ice and snow. But not all caribou are alike. Although they belong to only one species, caribou vary in behaviour, ecology, genetics, and even physical appearance because they have been shaped by the diversity of northern habitats and Canada’s vast geography. Indigenous Peoples have long recognized caribou types, some migrating up and down mountains, others spending all year in lowland boreal forests, while the famous barrenground herds migrate hundreds of kilometres between coastal Arctic tundra (where they give birth to their young) and boreal forest (where they scatter into small groups to spend the winter beneath the tree canopy). Indigenous Peoples' deep knowledge of caribou makes them ideal partners in the work of saving caribou and we must go beyond mere “consultations” in working with the people for whom these creatures are cultural and spiritual touchstones. 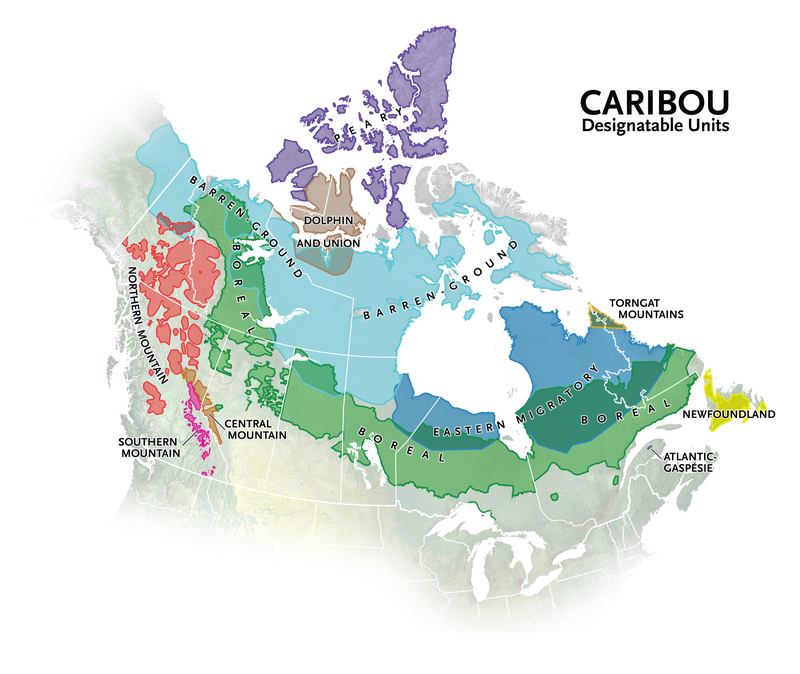 Our scientific understanding of the diversity of caribou has resulted in the mapping out of 11 types or "designatable units" in bureaucratic parlance. Each of these units is composed of anywhere from one to 60 separate herds (or individual populations). And each different type of caribou has different needs, meaning we cannot apply one-size-fits all solutions to ensuring their survival. During the nine years I served on the Committee on the Status of Endangered Wildlife in Canada (the body that undertakes assessments of Canada’s wildlife species under the federal Species at Risk Act), the single most challenging task was systematically evaluating the status of these 11 groups of caribou. The committee did this through the production of six status assessment reports during the period from 2012 to 2017, which involved the collective efforts of hundreds of people. For each report, it took two to three years to assemble the data (including Indigenous knowledge), then compile them into a comprehensive report, subject the report to robust review, before finally delivering the results to the COSEWIC table for a vote on status. While numbers tell the story, they are often hard and expensive to come by. The differing ecology of the various kinds of caribou demand different survey techniques and present different challenges. For the 15 or so herds in the barren ground caribou DU, for example, the best time to count numbers is when they gather during June and July for calving or to avoid insects. But as straightforward as this sounds, it is no easy feat to get airplanes to remote locations safely and on time. Weather doesn’t always cooperate and it is not uncommon to miss brief windows of opportunity and have to wait for another year. The result? Many herds have not been surveyed in years. Other caribou populations are dispersed across vast areas, hiding under the tree canopy (in the boreal) or tucked away on remote, hard-to-reach islands in the High Arctic (such as Peary caribou), which makes getting a handle on numbers next to impossible. Sadly, the populations might be most easily tracked where herds have diminished to only a handful of animals, such as in the central and southern mountain groups in Alberta and British Columbia. The situation is further complicated by the well-understood phenomenon — long noted by Indigenous peoples — of cycles or fluctuations in caribou populations, sometimes in a fairly regular pattern. Some have almost entirely disappeared, such as the Dolphin and Union caribou in the 1920s, only to rise again in numbers decades later. But in most cases where historical fluctuations have long been documented, continued population declines with little sign of resurgence (such as healthy calf production) are of profound concern. In fact, almost none of the areas where caribou now roam show signs of recovery following population declines. The collective picture that continues to emerge is both distressing and discouraging. That picture is shown in these two maps, which compare the status of caribou in 2004, the last time caribou were assessed, and 2017 (some modest changes in DU boundaries, mostly for mountain caribou in the West, make this not quite a perfect comparison). All caribou in Canada are now at some risk of extinction, with more than half the DUs meeting the scientific criteria for endangered and the others either threatened or special concern. Since 2004, only one group, Peary caribou, showed improvement, going from endangered to threatened. This as a result of some evidence of population recovery as warmer summers boosted forage growth after severe population die offs from weather events during the 1990s. Reasons for caribou’s poor prospects vary, but the common thread is the glacial pace of any actions to address well-identified threats or common concerns. For boreal and mountain caribou, it is all about destruction of habitats by oil and gas, logging and other industries leading to heightened levels of predation (which is further exacerbated by recreational activities in some places). And in many ranges across these four DUs, resource development has been allowed to continue, largely unabated. Rather than setting limits on habitat disturbance within imperilled caribou ranges, governments continue to rely on largely ineffectual project-by-project impact mitigation. In northern herds, where there is less habitat clearing, an accumulation of factors is likely driving the declines, including climate change and, in some cases, hunting. For both Dolphin and Union and Peary caribou, moving across sea ice is a constant in their annual travels, but now these movements could be disrupted by both weaker ice and increased ship traffic. So what happens now? Listing a species under the Species at Risk Act is the first step, but the stages that follow are all too often painfully slow and plodding. One of the most difficult is the examination of socio-economic factors that might arise from protection measures and long drawn-out consultations on these. For example, despite being first assessed as endangered in 2004, Peary caribou were not formally listed for protection under the Species at Risk Act until 2011 and recovery planning only began in 2014, just when COSEWIC embarked on its 10-year re-assessment. For the caribou populations that have been listed for protection, often after long delays, the stages that follow are taking far too long in almost all cases. While the management plan was being written for Dolphin and Union caribou, for example, the very factors being written about in the plan worsened and these caribou had to be reclassified as endangered. But even at this stage, action depends on the provinces and territories, which have shown a marked lack of interest in taking strong steps to protect caribou. Boreal caribou are the most high-profile example of this, where five years after listing, Environment and Climate Change Canada found in its own progress report that habitat conditions of most of the 51 ranges had deteriorated in spite of identification of critical habitat, which is legally required to be managed to retain caribou. The fate of caribou is about more than a single species. In many ways, the fate of caribou also represents the fate of Canada’s North. And right now, we have plenty of reason to worry about where things are headed. Our vast northern lands still contain globally important intact areas — the kind of wild spaces species such as caribou depend on for their survival. But these largely undisturbed areas don’t exist due to good planning or political foresight. They are simply remote enough to have not been exploited — yet. The question facing caribou and the North is 'are we willing to change our approaches and adopt new paradigms or will we just continue with the destructive status quo?' Change means placing clear limits on human activity, doing everything we can to lower our climate impact and fulfilling government obligations under the Species at Risk Act. A good start would be to get Species at Risk listings finished quickly, while also putting recovery plans into action through bold land-use planning decisions. Actions must include a mix of incentives, innovation in resource extraction, restoring habitat and acting as if failure is not an option, instead of waiting for legal challenges over inaction to spur last-gasp efforts. Caribou are Canada’s responsibility and we owe it to the world, and ourselves, to take that responsibility seriously. Justina C. Ray has a PhD in wildlife ecology and conservation and is president and senior scientist of Wildlife Conservation Society Canada. From 2009 to 2017, she was co-chair of the terrestrial mammals subcommittee of COSEWIC. She is co-author (with Monte Hummel) of Caribou and the North: A Shared Future.